This is an old post, but one that people ask me about often! Hope you enjoy it! I love this quote, it is so true the more organized I am on Sunday the better week I have. It is a great day to reflect, plan, and thank the good Lord for the beautiful life we have been blessed with. Remember how I mentioned the other day my new found love for Aromas Coffee Bar and their skinny vanilla chai tea? Since I only go to Charles City twice a week I had been experimenting with different kinds of chai tea bags and found nothing that worked. 🙁 So, I did what every 30's something woman would do...scoured Pinterest! I found quite a few recipes, but none that I loved. This weekend I concocted my own skinny vanilla chai tea!!! It comes nowhere near to Aaromas, but it is probably as close as I will get at home. It made a large Tupperware full and will probably last a few weeks, well maybe, all four of us have really been loving it! The recipe that I came up with is at the bottom of this post. The mixture looks like this, you can run it through a food processor until it is a fine powder. 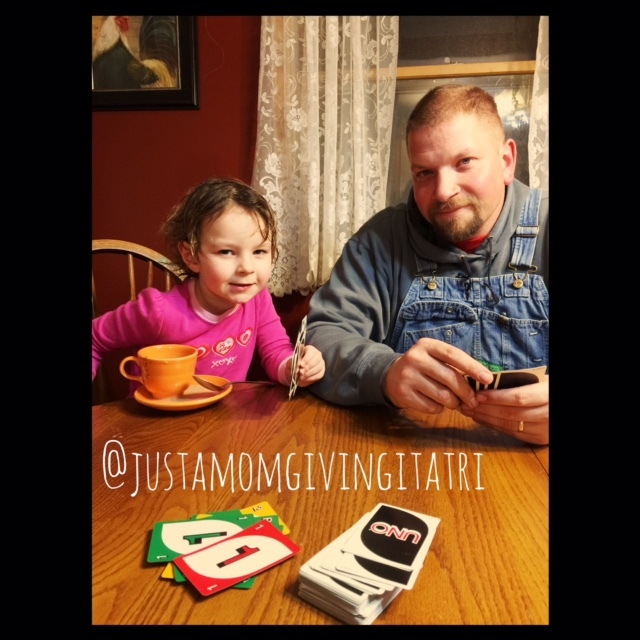 A little game of UNO and some more skinny vanilla chai tea after supper! Mix all powdered ingredients together in a Tupperware container. You will add 2 Tablespoons to 8 oz. of water or hot milk. To make this skinny you will need to use skim milk or almond milk. I like to heat the almond milk or milk to 145 degrees. That makes the perfect drink for our family! Next time I am going to experiment with less sugar and I am going to keep track of how many drinks this mixture makes. I am guessing it will last at least a couple of weeks in a tightly stored container. It would make a great gift to give someone in a pint jar with the directions to make a nice cup! Do you like to make things homemade? Have you ever made homemade do it yourself gifts?